“The real corruption that has eaten into the heart of British public life is the tightening corporate grip on government and public institutions – not just by lobbyists, but by the politicians, civil servants, bankers and corporate advisers who increasingly swap jobs, favours and insider information, and inevitably come to see their interests as mutual and interchangeable… Corporate and financial power have merged into the state.” – Seumus Milne. The Conservative privatisation programme has been an unmitigated failure. We have witnessed scandalous price rigging, and massive job losses, decreased standards in service delivery and a disempowerment of our Unions. 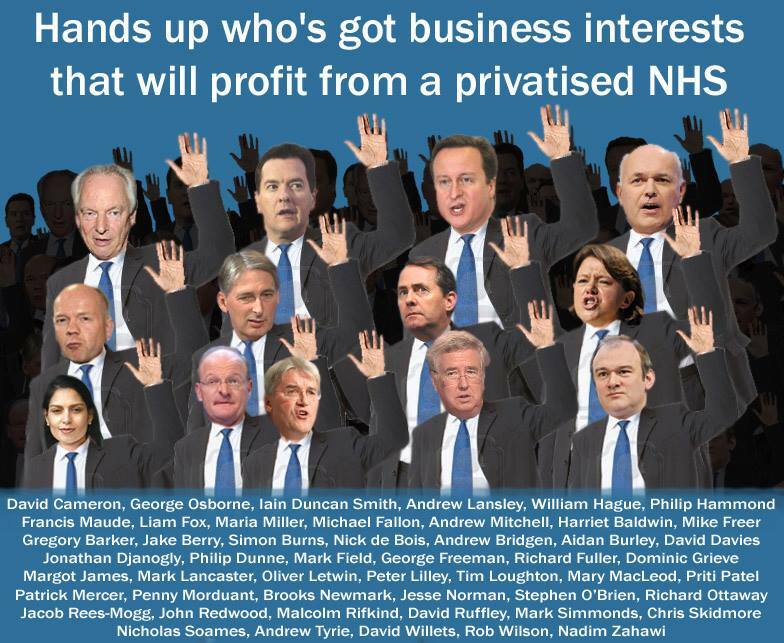 But then the Tories will always swing policy towards benefiting private companies and not the public, as we know. In Britain, privatisation was primarily driven by Tory ideological motives, to “roll back the frontiers of the State”. The “survival of the fittest’ Conservative social policies are simple translations from the “very privileged survival of the wealthiest at all cost” and “profiteering for Tory donors and sponsors'” economic ideology. So we ask ourselves who benefits from this “scheme”. Big business does of course. They get free labour, funded by the tax payer, to maximise profits. The service providers also benefit. What this means is that the money “saved”’ in public sector cuts has been used to subsidise some of this Country’s richest companies, and they have been provided with free labour from a reserve of State induced unemployment. Workfare is nothing less than the gross exploitation of the economic victims of this Government. The apparent Conservative desire for wider share ownership in some instances of privatisation was certainly intended to make the privatisation reforms difficult to reverse: it would make them very expensive to reverse, but also, it’s partly because re-nationalisation risks alienating the critical middle class swing voters in the electorate, quite apart from the fiscal implications. Private ownership is considered by the Tories as one of the better ways of reducing the power of the trades unions, and with it the perceived support for the opposition Labour Party. Indeed, creating counterweights to the perceived and mythologised “monolithic” unions meant that inadequate attention was given to dispersed control and competition, evident in the early utility privatisations of telecoms and gas, for example. Privatisation and liberalisation are distinct policies, whilst it is possible (and common) to privatise services without liberalising, it is less often understood that one can liberalise without privatisation. For example, it is quite common for gas and electricity distribution networks to be municipally owned, with private ownership elsewhere. After the collapse of Railtrack, the British Government created Network Rail, a not-for-profit-distribution public-private partnership, a quasi-commercial public entity that is a compromise between the desire to renationalise and a desire to keep the debt off the public sector’s balance sheet. Roads are almost entirely in public ownership while transport services are almost entirely privately supplied. The main case for privatising networks like the power grid is that they can be more effectively exposed to profit-related incentives, while at the same time clarifying the nature of regulation, and separating the regulatory and ownership functions. Of course the alternative view is that the state can better pursue its interests [on behalf of citizens] by direct control through ownership than by indirect control through regulation. Tory privatisation has been a total failure. It’s entirely ideologically driven. 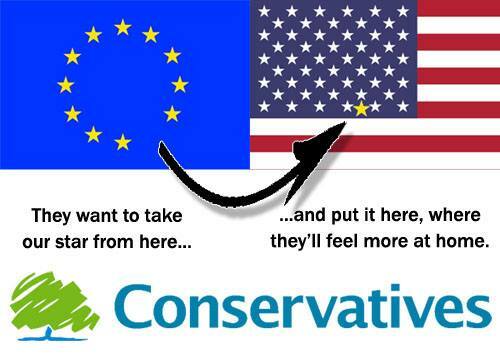 The Conservatives are endorsing the Trans Pacific Partnership (TPP) and the Transatlantic Trade and Investment Partnership (TTIP) , which will enshrine the rights of Corporations under International Law, and restrict future governments in overturning the changes through the threat of expensive legal action. These are the largest trade agreements in history, and yet they are NOT open for review, debate or amendment by Parliaments or the public. This agreement will shift the balance of power between Corporations and the State – effectively creating a Corporatocracy. It will have NO democratic foundation or restraint whatsoever. The main thrust of the agreement is that Corporations will be able to actively exploit increased rights in the TPP and TTIP to extend the interests of the corporation, which is mostly to maximise their profits. Human rights and public interests won’t be a priority. Six hundred US corporate advisors have had input into this trade agreement. The draft text has not been made available to the public, press or policy makers. The level of secrecy around this agreement is unparalleled. The majority of US Congress is being kept in the dark while representatives of US corporations are being consulted and privy to the details. A major concern is that many of the regulations likely to be affected under TTIP are designed to protect our health and the environment by setting safe levels of pesticides in food and chemicals in our toiletries and household cleaning products for example. These safeguards will be eroded or eliminated, potentially exposing people to greater risks of unsafe, unregulated commercial goods to support the interests of multinationals. In November, WikiLeaks published a draft chapter of the agreement – and the reasons for secrecy became clear. The draft confirms our fears that this agreement tips the balance of power between Corporations and the State and citizens firmly in favour of Corporations. The Transatlantic Trade and Investment Partnership includes a particularly toxic mechanism called investor-state dispute settlement (ISDS). Where this has been forced into other trade agreements, it has allowed big global corporations, already with too much power, to sue Governments in front of secretive arbitration panels composed of corporate lawyers, which bypass our domestic courts and override the decisions of parliaments and interests of citizens. Not that this would be a particular issue in the case of the UK, with the Government always favouring policies that promote the interests of such powerful businesses at the expense of the public, anyway. But this mechanism would also remove any chance whatsoever of public interests being a consideration in the decision-making process In short, it will bypass what remains of our democratic process completely. We have seen already that this mechanism is being used by mining companies elsewhere in the world to sue governments trying to keep them out of protected areas; by banks fighting financial regulation; by a nuclear company contesting Germany’s decision to switch off atomic power. After a big political fight we’ve now been promised plain packaging for cigarettes. But it could be anexed by an offshore arbitration panel. The tobacco company Philip Morris is currently suing the Government in Australia through the same mechanism in another treaty. In the UK, we already have a highly corporatised Government. These agreements will suppress internet freedom, restrict civil liberties, decimate internal economies, stop developing countries distributing the lowest cost drugs, endanger public healthcare, and hand corporations the right to overturn decisions made by democratic governments in the public interest. The chief agricultural negotiator for the US is the former Monsanto lobbyist, Islam Siddiqui. If ratified, the TPP would impose punishing regulations that give multinational corporations unprecedented rights to demand taxpayer compensation for policies that corporations deem a barrier to their profits. It seems to me that our Government has been paving the way for this shortcut to corporocratic hell since they took Office. If you want an idea of what kind of socio-political changes the outlined Agreements will entail, J P Morgan gave us a chilling preview, earlier this year. What J P Morgan made clear is that “socialist” and collectivist inclinations must be removed from political structures; localism must be replaced with strong, central, authority; labour rights must be removed, consensus politics [that’s democracy] must cease to be of concern and the right to protest must be curtailed. This is an agenda for hard right, corporatist government. Say goodbye forever to your human rights, to democracy, and to the environment. That this House is concerned about the inclusion of investor-to-state dispute settlements in the Transatlantic Trade and Investment Partnership (TTIP); notes that their inclusion would enable foreign investors to file complaints against a national government whenever investors perceive a violation of their rights and that these complaints are filed directly to international arbitration tribunals and completely bypass national courts and the judicial system; believes there is a real risk that these provisions in the TTIP could overturn years of laws and regulations agreed by democratic institutions on social, environmental and small business policy on both sides of the Atlantic and is of the view that the Government’s assertions about the economic benefits of the trade deal are questionable; further believes that any transatlantic partnership implies a relationship based on mutual trust, respect and shared values, something that the ongoing revelations about US secret services’ surveillance of EU citizens and public representatives up to the highest level has shown to be gravely lacking; therefore calls for investor-to-state dispute settlements to be removed from the TTIP; and further calls on the Government to push for talks on the partnership agreement to be frozen immediately, in order to allow for a full public debate and Parliamentary scrutiny from both Houses of Parliament with a view to establishing whether full transparency and fundamental EU rights and rules can be guaranteed. The Alternative Trade Mandate Alliance (and the Corporate Europe Observatory), which has just been launched, is a European alliance of over 50 civil society organisations. It forwards a proposal to make EU trade and investment policy work for people and the planet, not just the profit interests of a few. Europe, of course, has a much better track record when it comes to Freedom and Human Rights…..
Where on earth do you people pick up your warped world view? It has absolutely no basis in reality! The European Court of Justice rules on European Union (EU) law while the European Court of Human Rights rules on European Convention on Human Rights which covers the 47 member states of the Council of Europe. Cases cannot be brought in ECtHR against the European Union but the Court has ruled that states cannot escape their human rights obligations by saying that they were implementing EU law. So you see, there’s quite a clear distinction. The European Union (EU) is not a member of the Council of Europe and the European Union takes the view that whilst it is bound by the European Convention it is not bound by the rulings of the European Court of Human Rights. It is from the EU that trade regulations and agreements originate and not the ECHR. This article is about the implications of EU real trade agreements, in the real world. I have written elsewhere about ECHR Human Rights issues, in the real world. And, of course, it has started in Europe, with two companies that make bee-poison neonicotenoids suing the EU over the ban. Thanks Robert. Yes, that’s got some terrifying implications for our environment and the ecosystem, the balance of which is essential for our own survival, too. It cannot be right that big multinational companies such as these can openly declare that all they are interested in is making profit, at such potentially terrible costs to all life. The agrochemical industry that challenge the ban on neonicotinoids ignore the increasing body of new science that documents neonicotinoid toxicity to bees and other pollinators, but also, it is a known neurotoxin to mammals. “Less toxic” to us doesn’t mean “none toxic”. In March 2013, the American Bird Conservancy published a review of 200 studies on neonicotinoids including industry research obtained through the US Freedom of Information Act, calling for a ban on neonicotinoid use as seed treatments because of their toxicity to birds, aquatic invertebrates, and other wildlife. Once used, neonicotinoids remain in the soil for up to 10 years. And apparently, getting crop seeds that are free of this family of chemicals is becoming almost impossible in some parts of the world. And of course our own typically Tory Government voted against the EU ban. “Transnational firms and industry organisations have a great deal of access to the Commission to dictate what they want from the Trade Commission’s negotiating. These include American lobbying organisations, such as the American Chamber of Commerce and US legal firms which, because of legal confidentiality, do not have to disclose on whose behalf they are lobbying. This article is cited and referenced in here. It’s a book printed in November 2015 by a socialist think tank, the Foundation for European Progressive Political Studies (FEPS), in Brussels.